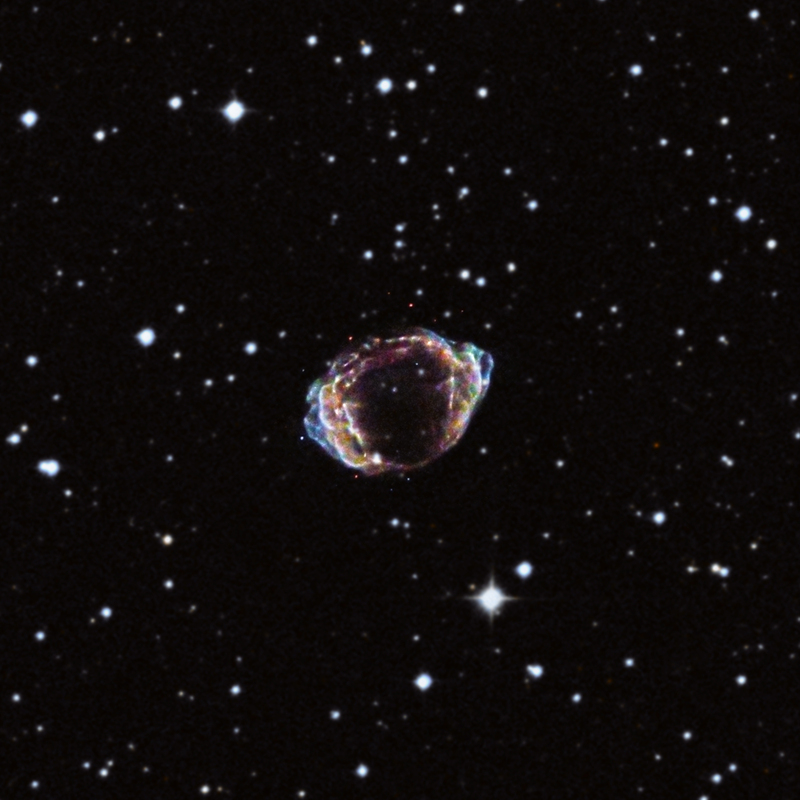 G1.9+0.3 is the remains of the most recent supernova, in Earth's time frame, known to have occurred in the Milky Way. If gas and dust had not heavily obscured it, the explosion would have been visible from Earth just over a century ago. A new long Chandra observation - equivalent to over 11 days of time - reveals new details about the explosion. G1.9+0.3 is located about 28,000 light years from Earth near the center of the Milky Way. Astronomers estimate that a star explodes as a supernova in our Galaxy, on average, about twice per century. In 2008, a team of scientists announced they discovered the remains of a supernova that is the most recent, in Earth's time frame, known to have occurred in the Milky Way. The explosion would have been visible from Earth a little more than a hundred years ago if it had not been heavily obscured by dust and gas. Its likely location is about 28,000 light years from Earth near the center of the Milky Way. A long observation equivalent to more than 11 days of observations of its debris field, now known as the supernova remnant G1.9+0.3, with NASA's Chandra X-ray Observatory is providing new details about this important event. The source of G1.9+0.3 was most likely a white dwarf star that underwent a thermonuclear detonation and was destroyed after merging with another white dwarf, or pulling material from an orbiting companion star. This is a particular class of supernova explosions (known as Type Ia) that are used as distance indicators in cosmology because they are so consistent in brightness and incredibly luminous. The explosion ejected stellar debris at high velocities, creating the supernova remnant that is seen today by Chandra and other telescopes. This new image is a composite from Chandra where low-energy X-rays are red, intermediate energies are green and higher-energy ones are blue. Also shown are optical data from the Digitized Sky Survey, with appearing stars in white. The new Chandra data, obtained in 2011, reveal that G1.9+0.3 has several remarkable properties. The Chandra data show that most of the X-ray emission is "synchrotron radiation," produced by extremely energetic electrons accelerated in the rapidly expanding blast wave of the supernova. This emission gives information about the origin of cosmic rays - energetic particles that constantly strike the Earth's atmosphere - but not much information about Type Ia supernovas. In addition, some of the X-ray emission comes from elements produced in the supernova, providing clues to the nature of the explosion. The long Chandra observation was required to dig out those clues. Most Type Ia supernova remnants are symmetrical in shape, with debris evenly distributed in all directions. However, G1.9+0.3 exhibits an extremely asymmetric pattern. The strongest X-ray emission from elements like silicon, sulfur, and iron is found in the northern part of the remnant, giving an extremely asymmetric pattern. Another exceptional feature of this remnant is that iron, which is expected to form deep in the doomed star's interior and move relatively slowly, is found far from the center and is moving at extremely high speeds of over 3.8 million miles per hour. The iron is mixed with lighter elements expected to form further out in the star. Because of the uneven distribution of the remnant's debris and their extreme velocities, the researchers conclude that the original supernova explosion also had very unusual properties. That is, the explosion itself must have been highly non-uniform and unusually energetic. By comparing the properties of the remnant with theoretical models, the researchers found hints about the explosion mechanism. Their favorite concept for what happened in G1.9+0.3 is a "delayed detonation", where the explosion occurs in two different phases. First, nuclear reactions occur in a slowly expanding wavefront, producing iron and similar elements. The energy from these reactions causes the star to expand, changing its density and allowing a much faster-moving detonation front of nuclear reactions to occur. If the explosion were highly asymmetric, then there should be large variations in expansion rate in different parts of the remnant. These should be measurable with future observations with X-rays using Chandra and radio waves with the NSF's Karl G. Jansky Very Large Array. Observations of G1.9+0.3 allow astronomers a special, close-up view of a young supernova remnant and its rapidly changing debris. Many of these changes are driven by the radioactive decay of elements ejected in the explosion. For example, a large amount of antimatter should have formed after the explosion by radioactive decay of cobalt. Based on the estimated mass of iron, which is formed by radioactive decay of nickel to cobalt to iron, over a hundred million trillion (ie ten raised to the power of twenty) pounds of positrons, the antimatter counterpart to electrons, should have formed. However, nearly all of these positrons should have combined with electrons and been destroyed, so no direct observational signature of this antimatter should remain. A paper describing these results is available online and will be published in the July 1, 2013 issue of The Astrophysical Journal Letters. The first author is Kazimierz Borkowski of North Carolina State University (NCSU), in Raleigh, NC and his co-authors are Stephen Reynolds, also of NCSU; Una Hwang from NASA's Goddard Space Flight Center (GSFC) in Greenbelt, MD; David Green from Cavendish Laboratory in Cambridge, UK; Robert Petre, also from GSFC; Kalyani Krishnamurthy from Duke University in Durham, NC and Rebecca Willett, also from Duke University. I've heard that the SNR has expanded in volume over the period of time we've known about it. I'm curious, what is in the center of the SNR A neutron star or a black hole? I have read a lot but cannot recall how often Novi and Super Novi occur in our Universe. Hello, It's a fine object... I will ask you a question, does the velocity of the torus surrounding 'spiral' galaxies, 'pull' gases from the disk, there for helping to produce shape. Very informative. The article was appreciated by High School students also who vist me weekly to clear their doubts. I am now in India. I was working as a professor in a college teaching physical chemistry in the U.S till 2002. I am retirerd now.Please help us by sendig more such informative articles. I could not imagine about the volume of our universe.I am very thankfull to those scientist working for this. Thanks a lot. 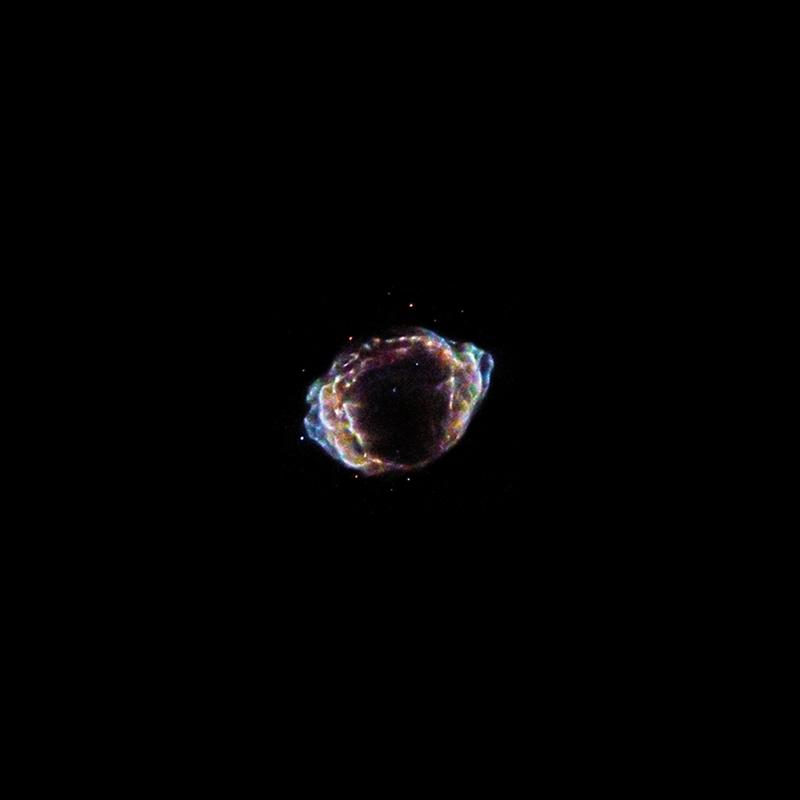 This smallish gas globule is curious compared to other supernova remnants we have observed. Could it be small (compared to Kepler or CassA) due to its youth? It also seems denser to me. Love it. A supernova remnant in the Milky Way located about 28,000 light years from Earth. About 28,000 light years from Earth. Combining X-rays from Chandra with optical data from Digitized Sky Survey. X-rays are red, green and blue, optical white and cyan.